Eat real food. Enjoy real health. 14 reasons to ditch the toast and jam (and 7 key tips to help you do this). After feeling like I’d taken a trip back to 2003 with some of the sports nutrition posts and articles I’d been reading lately, I got tagged in a cool picture from a listener of our Fitter Radio podcast – a triathlete who has switched from the traditional higher carb, lower fat diet approach to eating lower carb, higher fat, real food whilst training and commented she ‘didn’t know her 41 year old body could be the best body I have ever had’ (Woot! high fives all around!!) This coincided with finishing Mark Sisson’s Primal Endurance book. Mark outlines 115 reasons why athletes should train and eat the Primal Endurance way. I concurred with pretty much all of them. I have added my own 2c worth, added some literature below (and cut it down to 21 for brevity’s sake). While geared towards athletes, hands down this is applicable to everyone. Everyone. So if you’re currently eating toast and jam pre OR post training (or in general), I’ve outlined the 14 reasons why you need to ditch that junk and become a fat burning beast, and 7 key tips to help you get there. Western diet is based on excess grains and sugars (and low fibre) which stimulates excess insulin production, leading to lifelong insidious weight gain, chronic inflammation and elevated disease risk factors. A high carb, grain-based diet can leave endurance athletes nutrient deficient (due to phytic acid effects on minerals), inflamed and more susceptible to the oxidative damage of the stress of training, general life and poor nutrition. The way that most people consume modern grains (cereals, breads, pasta) ends up being a cheap source of calories which are immediately turned into glucose upon ingestion and offer minimal nutritional value. There are no good reasons to consume these types of grains and many good reasons not to, especially for those who are sensitive to gluten and other anti-nutrients found in wheat. Everyone is sensitive to the health compromising effects of grains at some level, especially the pro-inflammatory effects of gluten and the propensity for the lectins in grains to cause leaky gut syndrome. Even lean people suffer from the consequences of carbohydrate dependency, such as chronic inflammation, oxidative damage, and accelerated ageing and disease risk factors. Carrying excess body fat despite careful attention to diet and a high training load is largely due to carbohydrate dependency caused by a grain-based diet and chronic training patterns. Weight loss through portion control, low fat foods and calorie burning is ineffective long term. And while we think calories burned through exercise stimulate a corresponding increase in appetite – research might not back this up. I tend to think that people are more likely to eat more because they ‘reward’ themselves OR the long slow training allows increased opportunity to eat sports ‘junk food’ and the amount of calories burnt through training is far less than you think – and overestimated more so in females in certain instances. At any rate, the secret to weight loss is hormone optimisation, primarily through moderating excess insulin production. Endurance athletes can begin to dial in to their optimal carbohydrate intake by asking themselves the question ‘do I carry excess body fat?’ Any excess body fat calls for a reduction in dietary carbohydrate intake to accelerate fat burning. Endurance athletes who already have an optimal body composition but are looking to optimise training and recovery should choose high nutrient value carbohydrates. These include a high volume of vegetables, a moderate fruit intake, kumara/potatoes and other starchy tubers, dairy for those that tolerate, wild rice, quinoa and small amounts of dark chocolate. Endurance athletes with high calorie needs who also have an optimal body composition can enjoy occasional treats, but the habit of unbridled intake of nutrient-deficient carbohydrates should be eliminated in the interest of health and performance. Primal style eating (or eating minimally processed foods) is fractal and intuitive, and when escaping carbohydrate dependency and becoming fat adapted, you don’t have to rely on ingested carbs for energy. Eating patterns can be driven by hunger, pleasure and maximal nutritional benefit. Ketones are an internally generated, energy rich by-product of fat metabolism in the liver when blood glucose and insulin levels are low due to carbohydrate restriction in the diet. Ketones are burned efficiently by the brain, heart and skeletal tissue in the same manner as glucose. You do not need to be on a ketogenic diet to upregulate your ability to produce ketones – you can do this via a lower carbohydrate approach. Step one: omit sugars, grains, industrial seed oils for 21 days. Step two: emphasis highly nutritious foods such as meat, poultry, vegetables, eggs, nuts, fish, fruits, some full fat dairy, seeds, and kumara/potato. 100g or less of carbohydrate promotes fat loss, 150g is around maintenance level and over this could promote lifelong weight gain and over 300g could promote disease patterns. While transitioning to primal there are some struggles initially due to lifelong carbohydrate dependency and the addictive (for some) properties of sugar and excess grains and wheat. Headaches, dehydration, lower blood pressure and ‘dead legs’ are all initial side effects when removing processed food. Trust me – this too will pass. To minimise side effects, start the transition in a base-training phase of your training where training occurs at an easy pace. The transition phase can take anywhere from 2-12 weeks initially. Consume salt. Don’t underestimate the importance of this! Lower circulating insulin affects your body’s ability to retain sodium (and other electrolytes) – so we need more, particularly as processed food (of which you are no longer basing your diet around) is where you got around 70% of your sodium from. You can accelerate the process of fat adaptation by instigating some of the tactics used by athletes who opt to ‘train low’ – i.e. in a low glycogen training state. Some of these are naturally undertaken if you train without eating in the morning, or work out after dinner in the evening and don’t consume anything post-workout. If you’re new to this, have a read through to establish which might suit you best, and start instigating 1-2 x per week. Don’t undertake all of them as this aggressive approach could cause too much additional stress, derailing your plans to become a fat-burning beast. The FASTER study and Peter Attia, Sami Inkinen suggests any endurance athlete can become fat adapted and deliver performances that may be superior to carb-fuelled efforts all of the way up to anaerobic intensity. This is a new and growing research space, one AUT is testing, among other Universities around the globe. Strong, lean and awesome at 41y. PS What the Fat Sports Performance – currently an ebook, about to be published is one I can’t WAIT to read as well – sure to be a goody. This entry was posted in athlete, breakfast, endurance, health, nutrition, paleo, sports nutrition, tips, weight loss and tagged diet, endurance, exercise, female, inflammation, ketosis, lchf, marathon, nutrition, primal, real food, triathlon, weight loss, whole food. Bookmark the permalink. Great article Mikki! I also adopted the LCHF diet a few months ago and it has made all the difference in my cycling and swimming training. I am rarely hungry and by being fat adapted I recover so much faster after a hard workout. As far as I’m concerned it’s the only way to eat. Holiday weight gain? Read this. LCHF and IF for the female endurance athlete (IMHO). 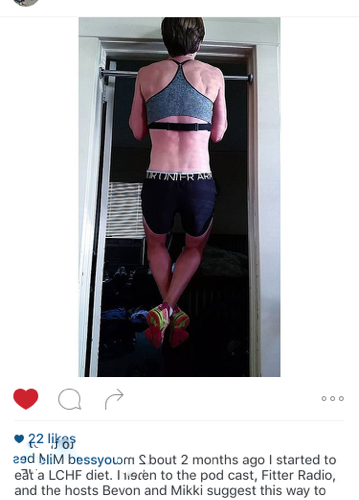 Mikki Williden on Injury-prone? Read this. Eat Real Food. Lift Heavy Things. Run Really Fast. Eat to nourish - Sweat to move - Think towards a happy & healthier life.